We’ve covered a handful of the best MKV player apps for the Mac before, but what if you have a Blu-Ray disc, DVD, or ISO that you want to make your own MKV file out of? 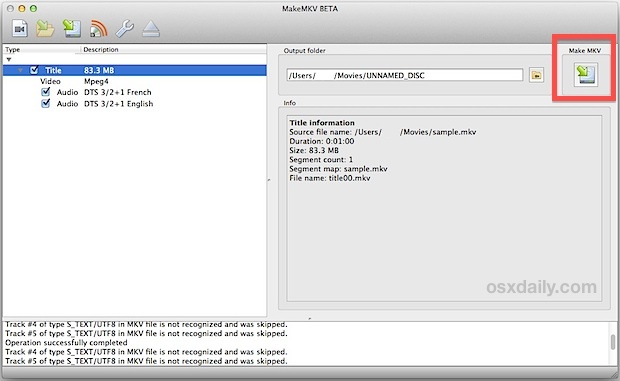 Creating a watchable MKV file on your computer from a Blu-Ray or DVD is commonly called ‘ripping’, and that’s exactly what we’re going to show you how to do with a great app called MakeMKV. Other apps may get the job done as well, but we’re focusing on MakeMKV because it is free, fast, efficient, and extremely easy to use. To be able to rip a Blu-Ray disc, you’ll obviously need a blu-ray player that is Mac compatible. Nearly any USB based Blu-Ray drive will work on the Mac, and there are plenty of these available as external devices with both read and write abilities which can be found on Amazon . If you’re aiming to rip a DVD instead, you’ll find that just about every semi-modern Mac with a built-in SuperDrive will do the job. This works to rip any compatible disc or file format* to an MKV, we’re running through this on a Mac but if you have a Windows PC with a BluRay disc the process should be the same because the app is cross-platform compatible. 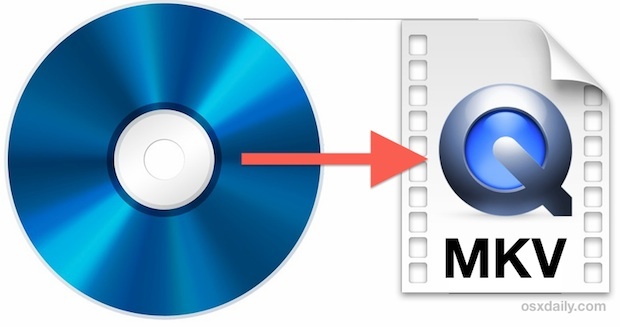 Blu-Ray discs and DVD’s can be quite large which makes converting take some time, but ultimately how long the entire procedure lasts depends on a few things: the length of the movie being converted, the speed of the Blu-Ray/DVD drive itself, and the performance of the Mac in general. For ripping an entire feature-length BluRay disc with all audio channels and features, don’t be surprised if it takes several hours, so it’s best to just let the process run it’s course and do something else while it completes. After you have converted the Blu-Ray disc or DVD to an MKV file, you can either copy it directly to an iPad or iOS device, or for better playback compatibility, convert them to an iPad compatible format first and then transfer the movie over to the mobile device. Converting them beforehand also has the advantage of offering compression, which is particularly desirable for iPad and iPhone users with smaller storage capacities, as a single ripped blu-ray or DVD disc can easily take up all remaining storage on an iOS device. Though MakeMKV can also convert a select few HD video file formats that aren’t directly on a disc, general movie files are best handled by dedicated video conversion apps like HandBrake, Miro, and QuickTime, which offer much more control over compression and output. MakeMKV is free for the time being while the app remains in beta, though it’s expected to turn into a paid app when the beta period ends. You’ll find there is a 60 day usage limitation on the beta, but when that time allotment runs out, all you need to do is re-download the app to the newest beta to reset the clock again and be able to use it for another 60 days – this is not some trick to horse around the developer, that is actually what they recommend users do while the app remains in beta. Are there better options out there? Perhaps, but for free, simple, and fast conversion, MakeMKV is one of the best we’ve found so far. If you know of something better, let us know on Twitter, Facebook, Google+, or send us an email.